Inspired by gender fluidity and globalization, the designers make eccentric avant-alternatives that pulse with hybrid charm, wacky wearability, and oodles of originality. 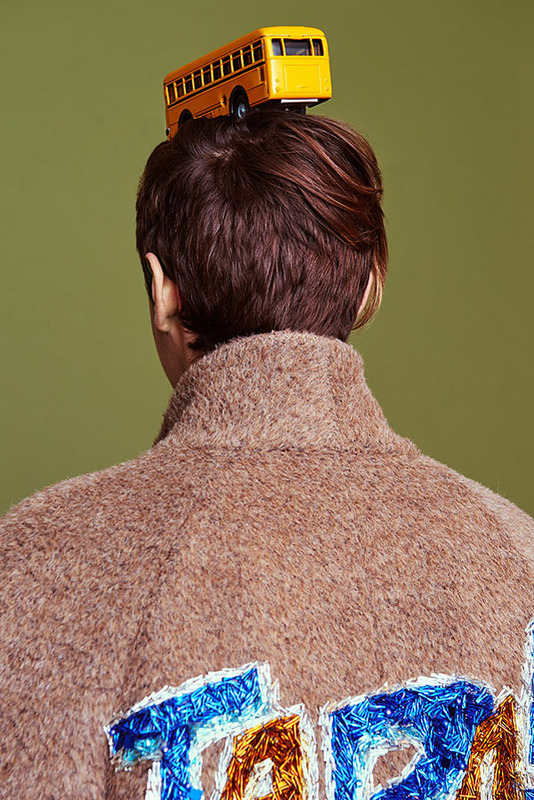 Standouts include satin velvet and silk wool varsity jackets, reversible raw-edged bombers, and jumpers embellished with artful appliques, and amusing onomatopoeia (like, ‘TADA’ and ‘TakaTaka’). They also make kickass paratrooper-inspired harnesses that pair well with outerwear and button-up shirts, or even short shorts for gals and guys. Where are you guys from and what’s your background? Siying Qu: I’m originally from Qinghai in Western China. I came to the U.S. when I was 15 as an exchange student (to North Carolina) and eventually moved to NYC and enrolled in Parsons. Haoran Li: I’m from Qingdao (pronounced like the beer, Tsingdao), China. We worked at a range of design houses and brands before we launched Private Policy, including Alexander Wang, Calvin Klein, and 3.1 Phillip Lim. How did you two link up? We met at Parsons. Our friendship and creative partnership blossomed from there. What's your underlying design philosophy? We aim to design a high-impact, cosmopolitan brand that transcends gender binaries and pushes artisanship to the max. We make fashion that is fundamentally wearable and cool. What recent references have you incorporated into the range? The film Snowpiercer is one. It's about a dystopian future, where an experiment to end global warming has left the Earth covered in ice and killed off all the inhabitants except for a class-divided few trapped on a train that never stops moving. It basically addresses the theme of social inequality, class hierarchy, and revolution. We were also inspired by the film’s storyline, wardrobe design, and cinematography. Other recurring references for us are youth culture, Chinese art history, unisex dressing, and modernist art. What is your division of labor like when you design and market your collections? Siying focuses on shape, silhouette, and style. I focus on textiles and fabrication. Our creative vision is united because we share the same aesthetic values and work toward the same creative and business goals. Who are some other Chinese brands you admire? We love Andrea Jiapei Li and Ground-Zero for their street savvy-meets-luxe appeal. Name your all-time favorite designers. Rei Kawakubo and Raf Simons. Favorite Chinese food in NYC? China Blue at 135 Watts St in Chinatown!